Be Patient With Yourself, Hard-work & Persistence Pays Off! Just a week later...the photo on the far right shows a lot of improvement. Shoulders are stacked over elbows, hips over shoulders, and hips are more properly aligned! 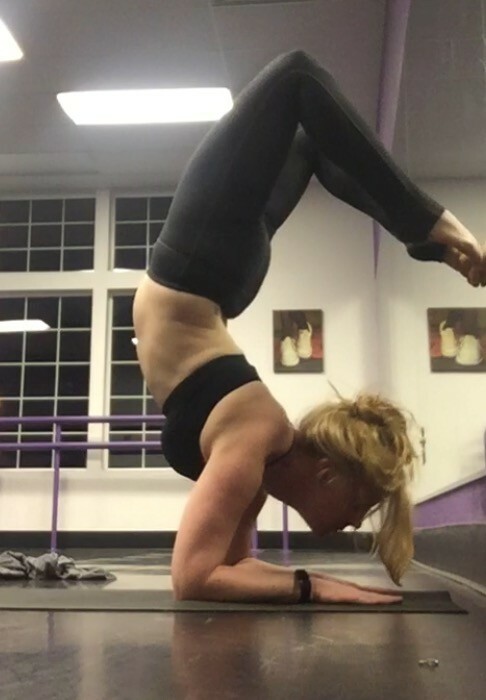 There have been so many times, I've seriously thought of giving up on doing inversion poses all-together. So. Many. Times. I thought I didn't have the upper body strength, then I thought it was my balance, and next I blamed my lack of "core" strength. The truth is, I was lacking in patience. Yoga is not like other activities. Yoga teaches us to practice, practice, practice. You can't go FASTER. You can't FORCE it. Yoga is a lesson in patience. Patience in today's world, is a virtue often forgotten. 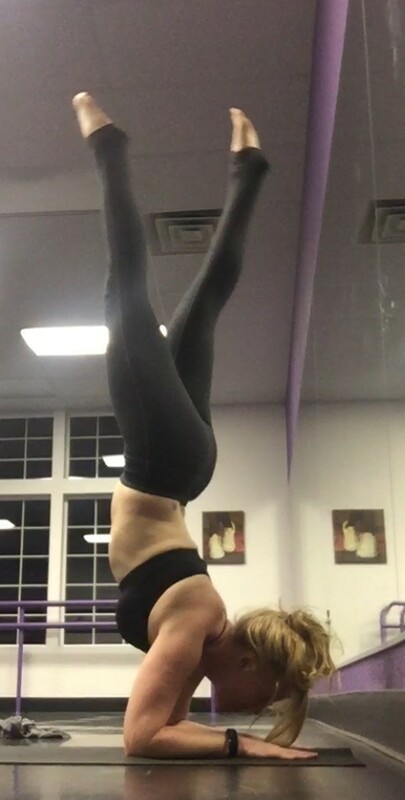 I've heard it discussed that the "yoga selfie" is one of the most despised selfies. I'm not a fan of selfies, but this morning I couldn't help myself. I took a few selfies, with a very specific purpose in mind. (No, it wasn't to capture how gorgeous I am at 5:00AM with hair undone, and nothing but my teeth brushed. It was to capture a moment I had been working on for over a year. This morning I set my phone up to capture me falling, over and over and over again. That's what usually happens as I practice handstand, or scorpion pose. Not today. Today, it happened. Today, I did my first scorpion. Yes, it was sloppy. Yes, I had my toes pushing against a wall to help with balance. Yes, there is A LOT of improvement to be made. I'm sharing it anyway. I'm sharing because it's imperfect. I'm sharing because it's encouraging to those who feel like no matter how hard they try, "it's just not going to happen". 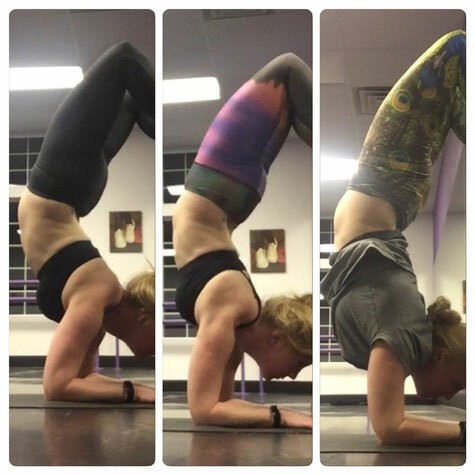 I'm sharing because people want to see their yoga teacher "mess up" too! Sharing any vulnerability allows us to become better leaders, better teachers, better parents, better humans. Vulnerability can be a vehicle for healing, and can open doors of communication for others to share insecurities. Don't rob yourself of that relationship, that moment of honesty and vulnerability. 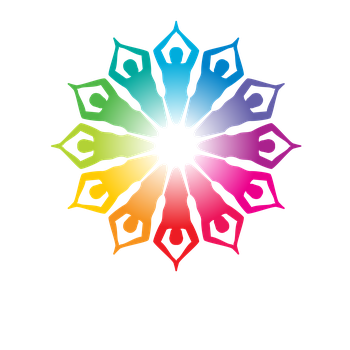 Enjoy your yoga journey. Share it with others. Rejoice in your little and BIG triumphs. Share your hard-work. It might just be the encouragement someone else needs to hear or see today. Patience, and persistence pay off in big ways. Not just in the accomplishment of the pose, but in the journey itself. Learning to breath through any pose translates into real-life. If you can breath through that pose, and not "lose it", you can breath through just about anything, and make it to safety on the other-side.